One of the earlier responses to The Fire That Consumes after its appearance in 1982 was this volume by Larry Dixon. As it happened, looking back from 25+ years later, Dixon’s work ranks high among traditionalist responses in terms of its tone, its scholarship and its candor. However, it shares most weaknesses common to books defending the traditionalist view, as this review points out in specific detail. This book defends majority evangelical understandings against the challenges of universalism, annihilationism, and the “wider hope.” Directed to a popular audience, it is well organized, attractively designed and easy to read. Although Dixon knows of no evangelicals who advocate universalism, he writes one chapter against the theory that all people finally will be saved. More relevant to JETS readers is Dixon’s response to two questions concerning what many call the “wider hope.” The first question inquires whether God might apply the benefits of Christ’s atonement to those among the unevangelized (AD as well as BC) who respond to him in faith based on general revelation, or on special revelation that stops short of the gospel. Dixon allows that “God is certainly capable of saving” such people (p. 102) but later says that anyone who reaches that conclusion is “mistaken” (p. 105). Apparently he believes that God can save the unevangelized through faith but does not believe that God will do so. The second question asks whether those who never hear of Christ while alive might receive an opportunity to hear and believe after death. Dixon concludes that “no clear texts” teach such a possibility (p. 120), and he urges readers to work and pray that all people will have opportunity to hear of Christ now. Evangelicals who suggest either aspect of the “wider hope” share Dixon’s zeal for world missions but also urge caution in view of God’s sovereign freedom when making pronouncements about the final destiny of those who die before they truly hear. That said, Dixon’s primary focus in this book is clearly the increasing rejection by evangelicals of the notion that hell requires everlasting conscious torment. Both sides in that debate affirm that the wicked will be raised to face God in judgment and then be banished into hell, from which they will never emerge. The only real question is whether God will preserve the lost alive in everlasting agony or whether they will completely and forever cease to exist after enduring whatever pain divine justice may require. Modern disputants agree that either scenario is within God’s power and that the answer must come from the Word of God. Even those who reject Dixon’s traditional understanding can appreciate his tone, which is more reasonable and far less vitriolic than recent defenses of everlasting conscious torment by J. Gerstner (Repent or Perish) and R. Morey (Death and the Afterlife). The majority position is well known and does not require repeating here. But Dixon’s side of the debate has yet to squarely encounter the exegetical underpinnings on which those rejecting everlasting conscious torment rest their view. To be specific, Dixon does not mention the dozens of verbs or scores of metaphors and similes that OT writers employ to foretell the end of sinners, all of which sound like total extinction. He does not examine the flood story or the destruction of Sodom, major OT paradigms of divine retribution and important vocabulary sources for later Biblical teaching. The omission leaves Dixon wondering why Rev 14:11; 19:3 mention smoke at all “if the work of destruction is complete” (p. 80), a problem quickly resolved by a glance at the symbol’s origin in Gen 19:27-28. Equally absent is any treatment of the multitude of assurances throughout the Psalms and Proverbs that a time will come when all the wicked will die, perish, be destroyed, be no more. Dixon barely mentions Isa 66:24, arguably the most important OT passage on the subject, and says nothing about its context, its probable historical background, or its first transformation by apocryphal Judith (16:17) from a disgusting scene of dead corpses to a sadistic one of conscious sinners in unending pain. He cites Mal 4:1-3 but dismisses it without exegesis (p. 79). Dixon acknowledges that eschatological Gehenna was named for an actual site outside Jerusalem (p. 134) but insists that the end of the wicked will not resemble the utter destruction that regularly transpired there. Thus he explains away Jesus’ warning in Matt 10:28 that God will “destroy both body and soul” in Gehenna (p. 125). He correctly notes that in rabbinic literature “gnashing of teeth” almost always denotes anger and not anguish (p. 163). He does not mention that it signifies anger throughout the Bible as well (Job 16:9; Ps 35:16; 37:12; Lam 2:16; Acts 7:54), or that those gnashing their teeth will finally melt away (Ps 112:10). He defines “unquenchable” fire according to Webster (pp. 80, 146) rather than by the Bible, where the adjective regularly denotes the irresistibility of God’s judgment that consumes (Ezek 20:47-48), reduces to nothing (Amos 5:5-6), or burns up what is put into it (Matt 3:12). Dixon devotes over half of his discussion of Jesus’ teaching to the parabolic story of the rich man and Lazarus, which Jesus borrowed from rabbinic lore but whose characters he changed to make his point (p. 135). Like others before him, Dixon stretches hermeneutical limits to find in this parable the post-judgment destiny of the lost. Even taken literally (no one really does) and out of context, this story offers no hint of how long the rich man’s suffering will last but portrays at most the intermediate state of a pre-Christian Jew. 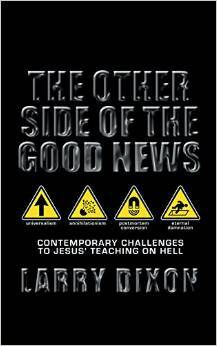 our hell on the cross” (p. 185) but does not explore at all the fruitful implications that truth has on this subject. He passes over the rich Pauline vocabulary of final punishment (other than commenting that the NT sometimes uses the words figuratively) and says nothing of how the same words were commonly used among Paul’s contemporaries. Relevant texts from Acts, Peter, James and Jude are similarly ignored. Although the lake of fire in Revelation clearly signifies the end of death (p. 119), Dixon argues that it cannot mean that when used of lost humans (Rev 20:15; 21:8). Instead he focuses on 20:10, the only passage in Scripture that connects “torment” with “eternal” or “forever” but that does not mention ordinary mortals (pp. 89, 143, 182). Dixon must be chided for ascribing evil motives to those who reject the tradition of everlasting torment, a swelling company that already includes J R W Stott, S Travis, J Wenham, M Green, C H Pmnock, and the late evangelical luminaries Ρ E Hughes and F F Bruce These men certainly do not share “modernism’s mindset” (p 182), form doctrinal positions based on “tolerance of all viewpoints” (p 16), or tailor their beliefs to achieve “a ‘kinder and gentler’ evangelicalism” (p 9) Such prejudicial remarks neither foster brotherly love nor advance constructive theological dialogue. JOURNAL OF THE EVANGELICAL THEOLOGICAL SOCIETY 37/4 (December 1984), pp. 624-626.